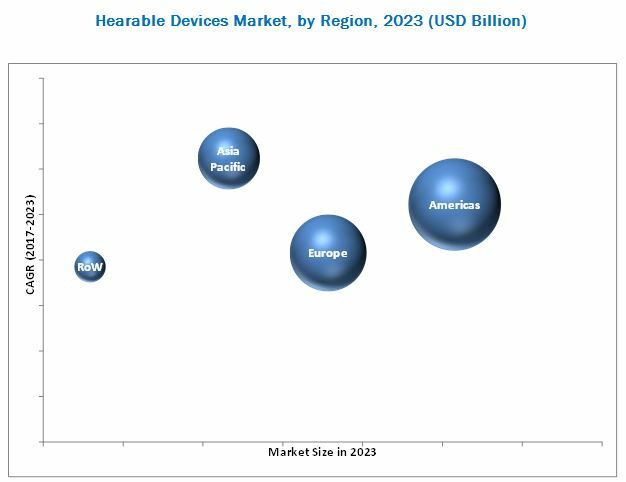 [152 Pages Report]The global hearable devices market is expected to reach USD 23.24 Billion by 2023, at a CAGR of 9.98% between 2017 and 2023. To benchmark players within the market using proprietary “Competitive Leadership Mapping Framework,” which analyzes market players on various parameters within the broad categories of business and product strategy. During this research , major players of the hearable devices ecosystem in various regions have been identified, and their offerings, regional presence, and distribution channels have been understood through in-depth discussions. To find the overall market size, top-down and bottom-up approaches have been used to estimate the sizes of other individual markets by using percentage splits from secondary sources such as Hoovers, Bloomberg Business, Factiva, and OneSource and primary research. The entire procedure includes the study of the annual and financial reports of the top market players and extensive interview of industry leaders such as CEOs, VPs, directors, and marketing executives for key insights (both qualitative and quantitative) pertaining to the market. The figure below shows the breakdown of the primaries on the basis of the company type, designation, and region conducted during the research . 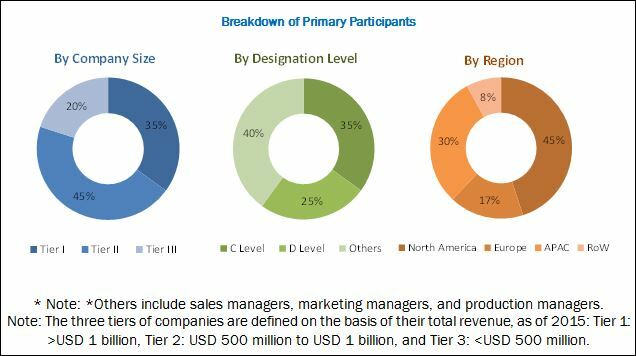 The ecosystem of the hearable devices market comprises a network of R&D institutions, manufacturers, technology integrators, and distributors among others. The key companies in the hearable devices market are Apple Inc. (US), Samsung Electronics Co., Ltd. (South Korea), Sennheiser Electronics GmBH, co. kg (Germany), Sony Corporation (Japan), and GN Store Nord A/S (Denmark). Prominent companies in the market include the well-established, financially stable and technically expertise players that have been operating in the industry for several years and have diversified product portfolios, proprietary technologies, and strong distribution networks through collaborations and acquisitions. The global hearable devices market is expected to increase to USD 23.24 Billion by 2023, at a CAGR of 9.98% between 2017 and 2023. Some key factors driving this market are the growing demand for smartphones as a source of entertainment; consumer preference for wearable and portable devices; increasing demand for health monitoring applications and hearing aids; and high investment in R&D for hearables by OEMs. The market for hearing aids accounted for the largest market in 2016. The huge market of hearing aids is accounted because of the increasing number of the hearing-impaired population across the globe. According to World Health Organization (Switzerland), more than 5 % of world’s population suffers from hearing loss. Companies in the market have a strong distribution network to ensure the customized hearing aid devices. They started offering new capabilities in hearables to the elderly and other patients. These hearable devices also help manage particular health conditions and disease states. The market for digital hearing aids is expected to grow at the highest rate during the forecast period. Digitally programmable hearing aids possess all the features of analog aids, but they use digitized sound processing. They are usually self-adjusting and offer greater precision for speech recognition and noise reduction. Digital hearing aids allow the use of the latest wireless connecting technologies such as Bluetooth and others. Among all the major applications of the hearable devices market, the market for healthcare application accounted the largest share in 2016. The evolution of technology allows people to measure heart rates and other parameters such as body temperature, blood pressure, pulse oximetry, electrocardiogram (ECG), electroencephalogram signals, and others using various smart hearable devices available in the market. Companies in this market also started offering new capabilities in hearables to the elderly and other patients. These hearable devices also help manage particular health conditions and disease states. In terms of regions, the Americas acquired the largest market for hearable devices in 2016. The market in the Americas is likely to be fueled by the increase in sale and distribution of hearing aids. The growing population of music listeners, increasing digital music sales, and the popularity of audio and video entertainment segment are expected to influence the regional market positively over the next decade. Technological improvements are mainly driving the hearable devices market in the Americas. Delivering high-quality audio in real time is the restraining factor for the growth of hearable devices market as the bandwidth constraint, delay in coding, and bit errors affect the wireless audio transfer. Also, latency is still an issue in wireless devices when it comes to real-time streaming. Apple Inc. (US) is one of the leading companies in the hearable devices market, followed by Samsung Electronics Co., Ltd. (South Korea) providing the wireless stereo headset, which provides very sophisticated U-shaped design, delivering clear voice quality with the help of noise- and echo-reducing NR and EC technologies. Companies are strengthening their product portfolio with new launches by increasing R&D investments.